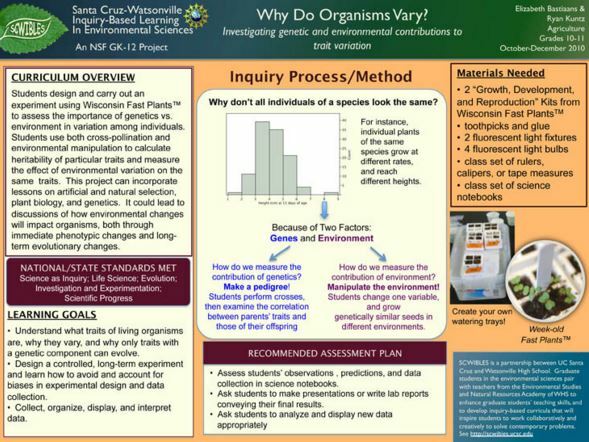 In this 2-month project, students design an experiment to assess phenotypic variation in one or more traits. 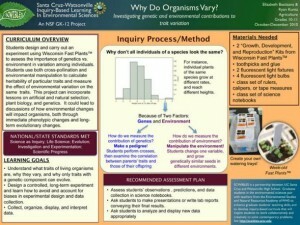 Students use Wisconsin Fast PlantsTM (Brassica rapa). In a breeding experiment, they select a trait and analyze it during two generations of plants. Students create a pedigree by cross-pollinating the first generation with those of other students to generate a second generation of seeds with known parentage. They use linear regression to measure similarity of the selected trait in both generations. The second experiment begins with the offspring generation: students select an environmental variable, and plant enough of those offspring seeds to control that variable, again measuring the selected trait, and using linear regression to analyze effectiveness of that environmental factor.